Place hazelnuts in food processor and process 5 to 7 seconds. Add dates and chocolate chips to processor and process until the mix starts to come together. Add coconut oil, vanilla and dash of salt pulse until it resembles coarse meal. (about 3 to 4 seconds more). Mixture should stick together when pressed between your fingers. If it doesn’t add in a small amount of water and pulse. Transfer mixture onto a parchment lined cookie sheet or cutting board, shape into a rectangle about 1/2 inch thick. Mixture will not fill the pan. Cover and chill in fridge for 30 minutes. Remove from fridge and cut into heart shapes using a heart shaped cookie cutter. Bring a small pot of water to a simmer boil, place a metal or glass bowl over the top of pot and place the chopped chocolate in the bowl, stir gently until completely melted and smooth. Carefully place heart into chocolate and gently spoon chocolate to cover, place on another parchment lined cookie sheet and allow to harden. When all hearts have been dipped you can place in fridge to harden. Place the jam in a small bowl and heat in microwave for 3 to 4 seconds to melt. Mix in the powdered sugar until smooth. It will seem like there is too much sugar, but keep mixing it will come together. Spoon mixture into a zip bag, cut a very small hole in one of the corners. 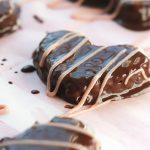 Remove hearts from the fridge, squeeze the sugar mixture over the chocolate covered hearts in a back and forth motion. Return to fridge until completely hardened. If you like you can store them in the freezer.